No. 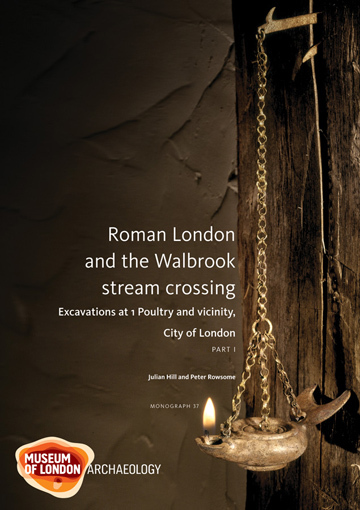 1 Poultry proved to be one of the most significant Roman sites ever excavated in the City of London, with an unparalleled sequence of buildings, roads and open spaces. A timber drain of AD 47 beneath the main road is the earliest securely dated structure yet known from Londinium, and a pottery shop, destroyed in the Boudican revolt, gives a snapshot of life in AD 60/61. A 2nd-century AD writing tablet preserves the only evidence for the sale of a slave found in Britain to date, while the 3rd- and 4th-century buildings found provide a rare demonstration of the continuities and changes that occurred in Roman urban life. A full digital resource of samples excavated at 1 Poultry and vicinity, City of London is available for researchers via Archaeology Data Service. ".. the book is easy to navigate thanks the narrative style, index and many detailed, well designed plans. Roman specialists pore over them. They could equally be dipped into by imaginative school teachers or anyone curious about the world of Roman Britain. The archaeology has matched Palumbo’s ambition for1 Poultry." "Future research on its databases and new ideas from excavations in London and elsewhere, including across the Channel, will mean it remains a prime resource for understanding Roman London." "… this definite account presents a wealth of new material and is essential reading for all with a serious interest in the archaeology of Roman London." "This report represents one of the most important single contributions to the archaeology of Roman London in recent years."